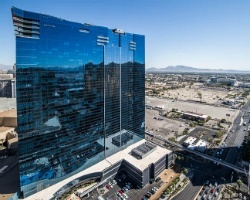 *Elara, a Hilton Grand Vacations Club* is your key to front-and-center luxury in Las Vegas! These 52 stories of fine accommodations and amenities are sure to impress, with no expenses spared in the fine kitchens and top-notch entertainment systems in-suite. The resort also features a pool with bar and cabanas to beat them all! What's more, Planet Hollywood Resort & Casino is right next door, and directly from there, guests can access the bountiful Miracle Mile! Hoover Dam, Red Rock and The Grand Canyon round out the list of attractions guests visiting Vegas might want to check out, should they opt to get out of the fast-paced city-- and if they do, they'll find these classics worth it! For more information, visit http://www1.hilton.com. *RCI Gold Crown/ Interval International Premier Rated* Featuring a finely appointed 2 bedroom, 2 bath lockout suite that will accommodate 8 guests comfortably. Usage is biennial odd in a floating week. For more information or to place an offer, please submit the inquiry form.